And an enormous mess it is. If you are a regular here at Mama’s, you know that it was extremely quiet around these parts last week. 5 of the 6 of us battled the flu all week. My husband was the lone survivor and I’m so grateful he was. There has to be one healthy (sane) person in the bunch and I’m happy for him that he was the well one. So what does 1 mama with the flu + 4 little people with the flu equal? A gigantic pile of laundry. This picture just doesn’t even do it justice. It’s hard to capture how large the pile really is. Thankfully we went into this flu event with all of our clothes clean. This past week just proves to me that regardless of how great your laundry routine is, there are going to be times where the laundry just gets out of control. So how in the world am I going to tackle this monster of a laundry pile? 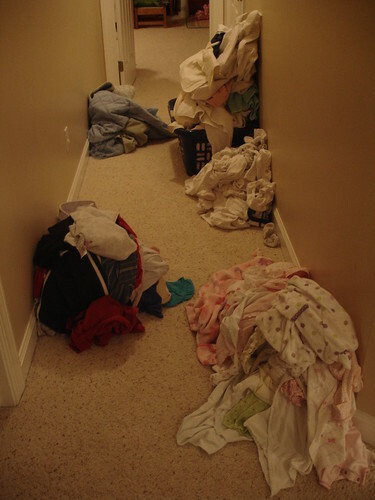 1) Send my two older children to each room of the house to gather up all randomly strewn clothing. I don’t know how it happens, but we constantly have socks at the back door or sweatshirts on the living room floor. And isn’t it interesting how every one else in this house seems to walk right by them without picking them up – as if they aren’t there? 2) Sit in the hallway and sort all of the clothes into piles. 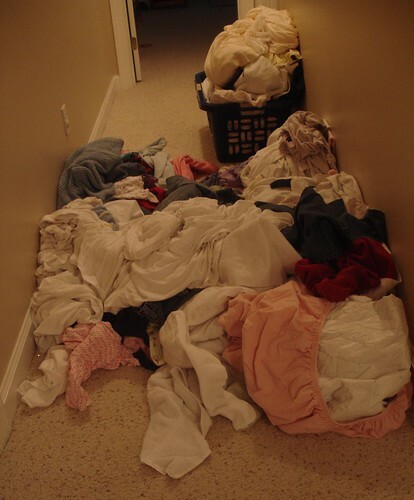 It is vital to take the 10 minutes this requires and completely sort all of the laundry. In the past I’ve just shuffled through the stack, picking out all of one item (such as jeans). But then I get 3 loads down the line and realize there is a lone pair of jeans at the bottom that I missed. Grr. Thankfully, I’ve changed my sorting ways. To avoid that, make sure to sort absolutely everything before putting the first load into the machine. If you click on the picture above, you’ll go to Flickr where you can hover over the loads and see how I sorted them. 3) Make laundry the top priority on my to-do list. While there are several other things that have to happen today (school, cut coupons, etc. ), I’m going to make sure that laundry is at the top of my list. That means I’m going to set the timer in the kitchen so I know when the laundry is ready to roll from the washer to the dryer. And stop what I’m doing (that’s hard for me) and go tend to it. We also aren’t going anywhere today. If I’m not home, then I can’t wash clothes. It’s as simple as that. I actually like to do laundry. I like the end result of freshly clean clothes in everyone’s drawers and fresh bedding. Unfortunately, the rest of my house looks like a tornado has blown through, and I don’t enjoy cleaning it quite as much! If I could somehow transfer my love of laundry to the rest of my house, I’d be set! What’s going on with your laundry today? Did you wash over the weekend, or do you have your work cut out for you today like I do? This is exactly what’s going on at our house today! I have a ridiculous amount of laundry that needs to be done. I do, unfortunately, have to run an errand today (need to be prepared for cooking class tomorrow!). But I am about to get my first load going and then get on to the school table! At least we know that we’re in the throws of laundry together…right?! Oh, and I will as well be clipping coupons. Are you doing kroger this week? I need help in that arena as well! We had company this weekend, and I didn’t get anything done in advance of their visit – so I’ve got a few piles waiting. I did two loads last night – which I started as the kids were doing bath/shower time. Got the necessities clean, and will work on the remaining loads over the next couple of days. Unfortunately, staying home to finish them isn’t an option for me this week. Glad you are all on the mend! I hope you get through all the laundry soon. I am glad you are all feeling better. You’re going to feel so great when all of that is done! My goal is to truly finish every last stitch of laundry today. It seems that the last few weeks my Laundry Day has stretched into the next few days because I don’t get it all folded and put away.